Home › Latest Post from 3DPRMS › October Filament Giveaway!! 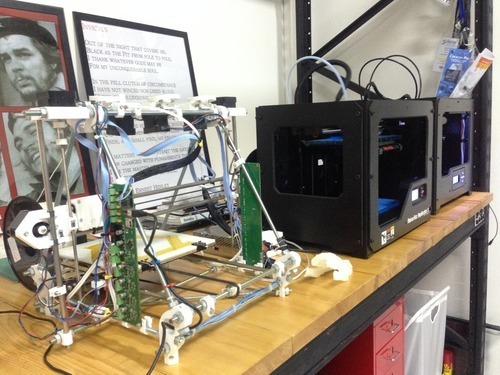 We would love to see your 3D printers and your workspace. Also tell us what is unique about your machine and why you love it so much. Most shared and discussed wins Taulman3D T-Glase (clear) and Nylon Bridge Filaments. This is how my workspace is set up. I have 3 machines and sometimes all 3 are churning at the same time and it's a beautiful thing. The reprappro tricolor mendel is more of a "for fun" and educational experience. From putting it together to actually getting the first print out, it was a nearly half an engineering degree (or at least a diploma). The next machine I acquired was the Makerbot Replicator 2.This one was the workhorse. The quality of prints was nothing short of brilliant. The ease of use and reliability of the printer was legendary. Although there were a few hiccups here and there, most notably when the nozzle was screwed on so tight I had to get help unscrewing, for the most part the Replicator 2 has been awesome. But i've always been on the lookout for something which would afford me more versatility in terms of materials. A heated bed was one of the necessary evils, but more then that I needed a reliable dual-extrusion 3D printer. That is where the FlashForge Creator Pro Dual Extruder 3D printer came into play. Although there is much more to the Creator Pro than the Replicator 2, the principles of usage are generally the same. And it did help that there was a lot of help from the Flashforge-SG crew. This is my workspace, my "babies" and my story. Share with us yours now, get your friends to share, like and comment on it and win some T-glase and Bridge Nylon from Taulman3d.